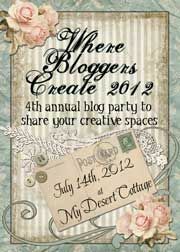 I just dropped by the fabulous blogsite of my good friend, Karen at Valentine Studio Designs, and picked up my button for her next Where Bloggers Create Party. She must have been thinking about me when she wrote that anyone can join the party even if your 'studio' is a table. 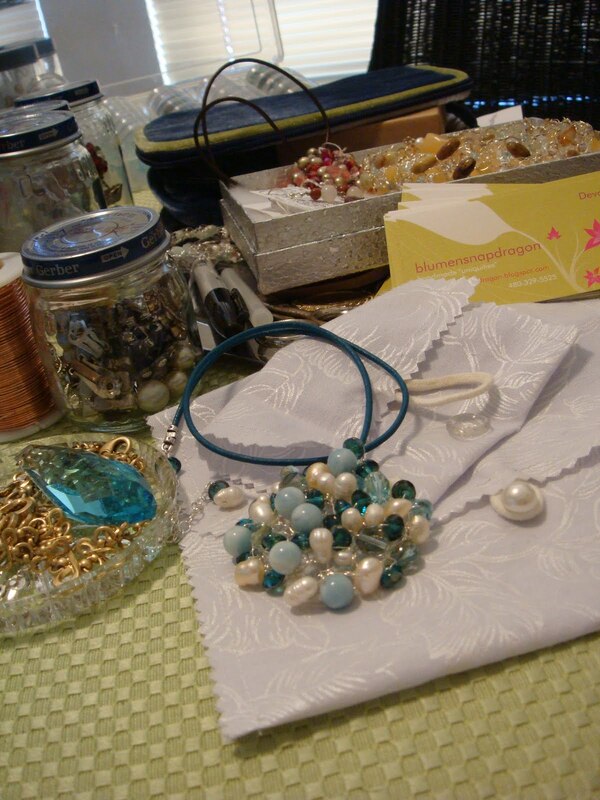 So, for the next month I will be working on jewelry for the party and my shop as well as taking pictures of my studio-table for the upcoming party. Hope to see all of you there! 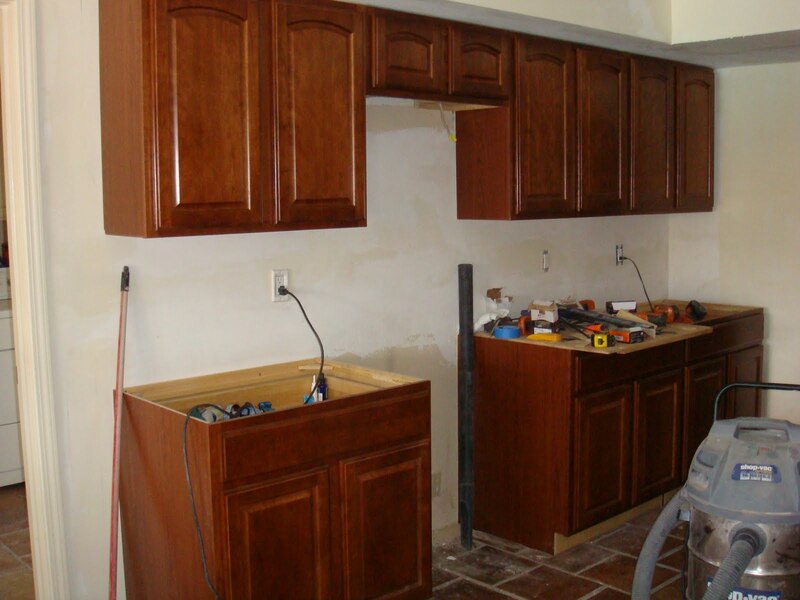 No better time for a remodel! Still no pictures of new jewelry and this is part of the reason: a home remodel. THANKFULLY, my dog and I have been living at my mother's house for the last several months and our good friend, who is renting our house, is not only doing everything himself (he happens to be a general contractor!) but is dealing with the horrible mess so we don't have to. So, between running to Home Depot, The Great Indoors, checking on-line for faucets, sinks, lights...going to the house to see progress, getting e-mails about faucets, sinks, lights...exchanging e-mails with my husband who is out of the country, I don't get much done. Ok, between that and taxes, certainly NOT getting much done! 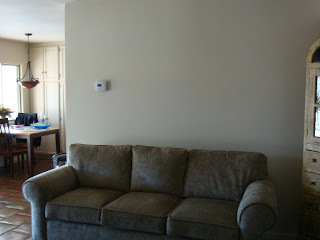 This is our ho-hum living room/kitchen wall. 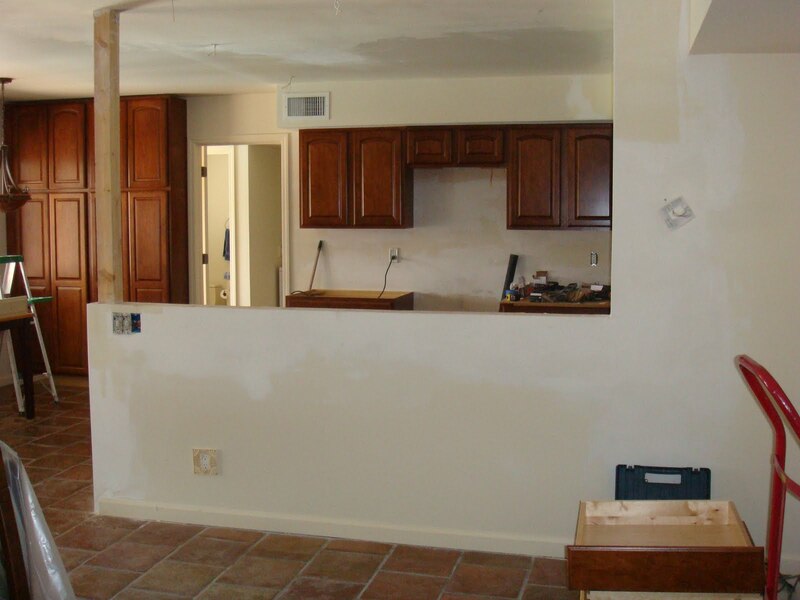 We have lived in our Spanish/Southwest style home for over 4 years and are taking advantage of our situation and giving our friend much needed work. 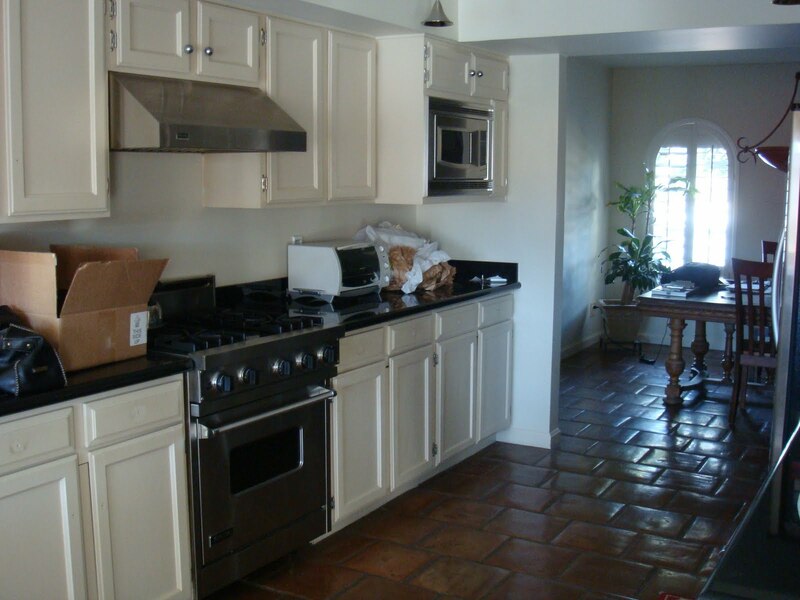 We wanted to open up the space to be able to interact with people in the kitchen (me) and with those in the rest of the house (my husband and the dog). 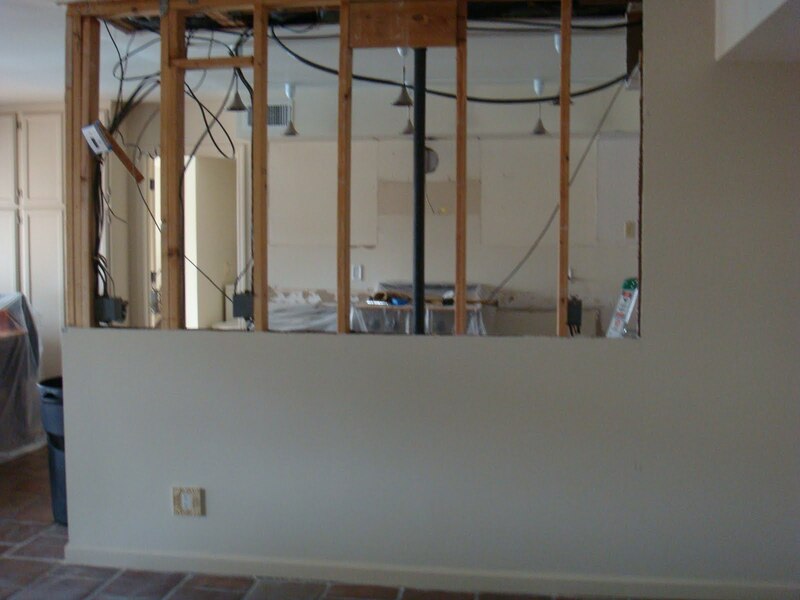 It is definitely open and it is a load-bearing wall. Finally, got rid of the old painted, warped, and ugly cabinets!!! This just feels more social and I am sooo excited for these new cabinets with pull out drawers! It is not done yet. Our black granite counter tops need to go back on and we are getting a granite bar top, and glass blown pendant lights will hang over the bar. It won't show up in the following picture, but do you see the entry into the dining room? Since there is an arch theme in the house my husband wanted one framing this entry and it turned out really well (husband is also a builder). Obviously, much more work to be done...I am a patient person and living with my mom has been a blessing. 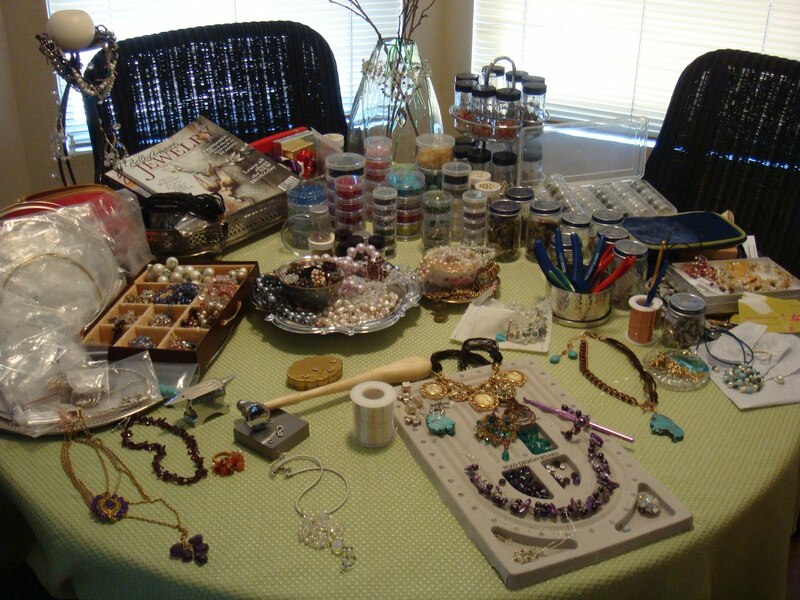 I have taken over her breakfast table with my jewelry and now her dining table with my sewing project (more to come) so we joke that we will be eating off of T.V. tables in the bedroom. I truly believe that no matter how old a 'child' gets, they always return to the nest at some point. It's a jewelry blog, right? Yesss. Technically. But a girl has to eat. See my Nov. 20, 2009 blog, Food As Inspiration and you'll gain more insight as to what really makes me tick. I am an amateur baker-bread mostly, but anything home baked...get in my belly! (Goldmember). 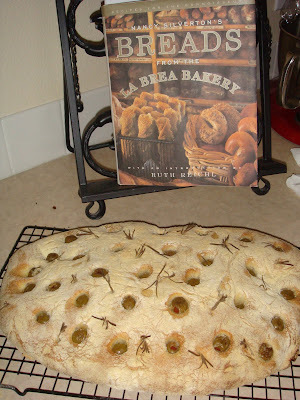 Right now I am in the mood for focaccia-the olive and rosemary one pictured. 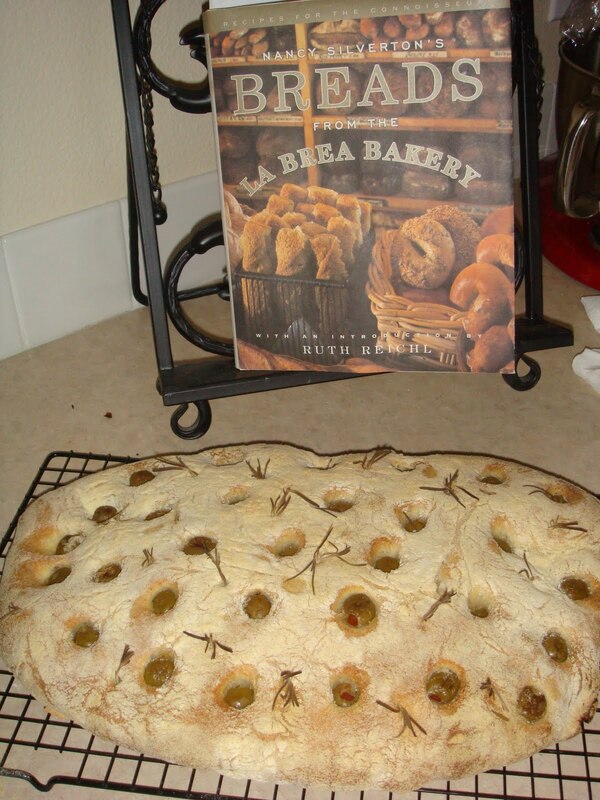 The recipe I use comes from Nancy Silverton's Breads from the La Brea Bakery. I have been there-it's this little hole in the wall near Hollywood and at most times of the day you stand elbow to elbow waiting your turn, hoping that the person before you doesn't take the last one of the one you are eyeing. She would not let me take a picture (even when I told her I came ALL the way from Arizona). If she only knew that I am extolling the wonders of her breads! Back to the bread, slice this baby (it made 2!) lengthwise and you have the most wonderful surface for gastronomic delight! Heck, just slather pesto on it while it is warm, in hale first, then shove it in. You are probably getting a vile picture of me eating like those hot dog eating contestants. As Julia Child used to say Bon Appetit! I already know how blessed I am for numerous reasons, now I can add lucky. Or is it luck that the women in my family (grandparents, great-grandparents, etc) were into jewelry? 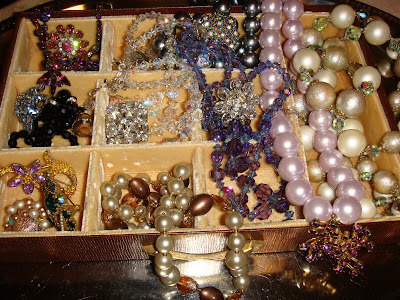 Then I marry into a family whose women love jewelry and voila!, I am the most excited recipient of the above vintage jewelry! And that is only half of it. It took several hours to clean and polish and so worth it-you almost have to squint it's so bright! Triple strands of large faux pearls with lime green crystals in between, triple strands of faceted blue and purple Austrian crystals, strands of faceted square (very unique) clear crystals, ornate rhinestone earrings and brooches just to list but a few. Most of it is in perfect condition and honestly, I will wear as is. 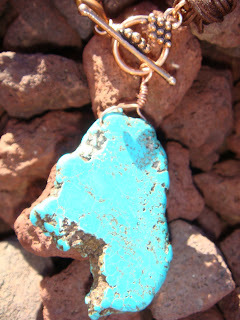 The rest will be redesigned into spectacular vintage/modern pieces to sell in my ArtFire shop. I feel LUCKY! My friend Marilyn once said to me, "Make things you love that you want to keep, that way you will be crazy about them and others will be too." 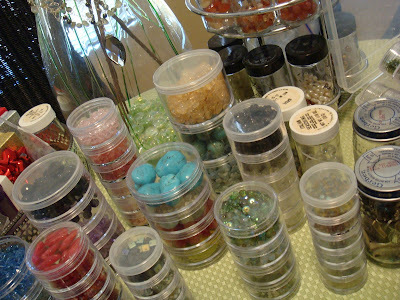 So I have adopted that mindset (try explaining that to your husband when you just started your jewelry business). I love it when I have completed an amazing piece and think, "I am going to have to make something like this because I am not letting this one go." 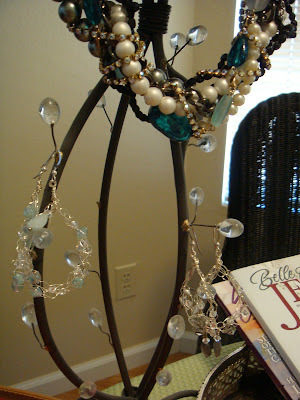 Needless to say, I adore this statement necklace! Three strands are vintage necklaces I received from my in-laws that I restrung and 3 plus a bracelet are new pieces also given to me. How lucky am I? VERY! I wore it recently to a fundraiser with a black tiered lace cocktail dress and all the women swooned over it. Last night I wore it to our monthly Bunco night with a pair of white jeans and a black sleeveless top and again all the ladies loved it. 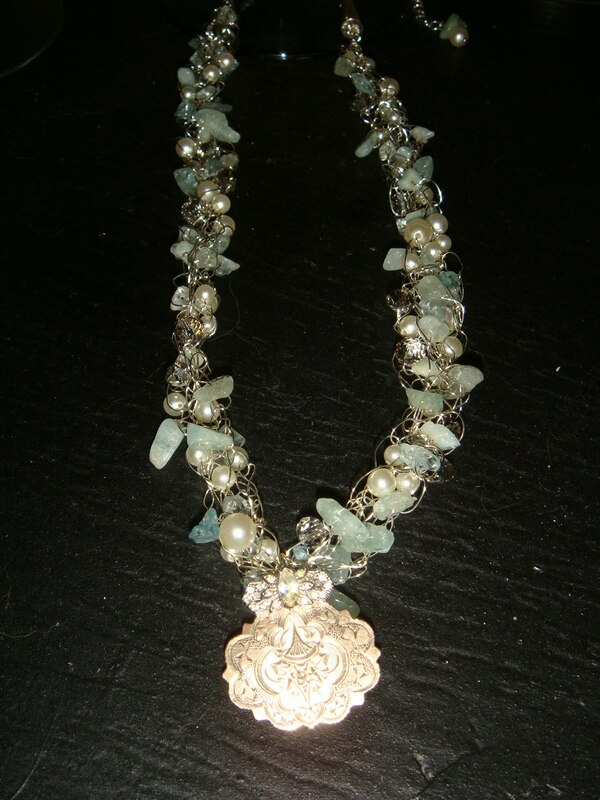 Right now The Necklace is on loan to a fellow Bunco Babe and is en route to Las Vegas where she will be modeling it at a wedding this weekend. She asked if someone offered me $10,000 for it would I accept? 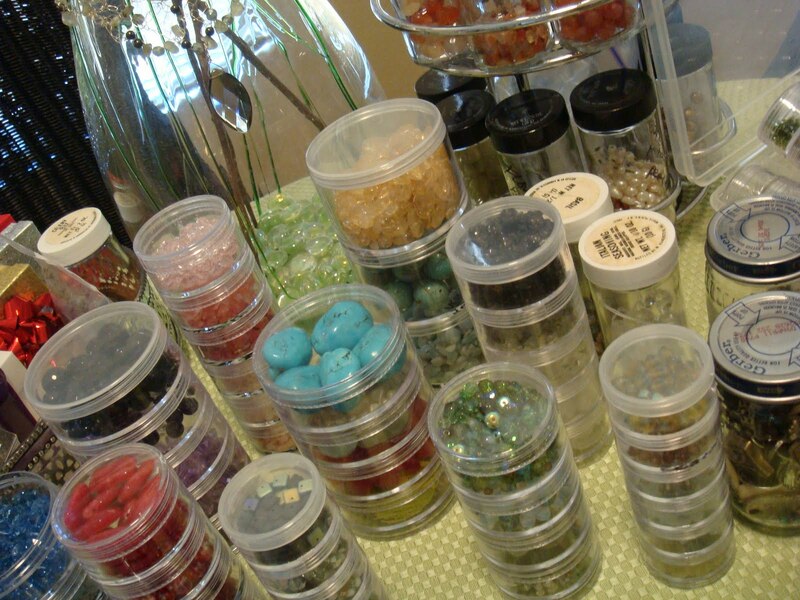 These are some of the fabulous goodies Marilyn and I found at the Tucson Gem & Mineral Show last month. 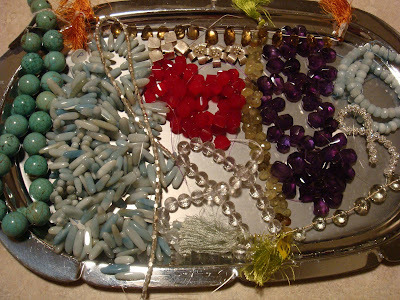 Take a look at that amethyst and that super pink chalcedony-with such a unique cut that I forget the name of it-, faceted aquamarine, sterling silver cubes and flowers, amazonite, crystals cut like onions and green garnet! 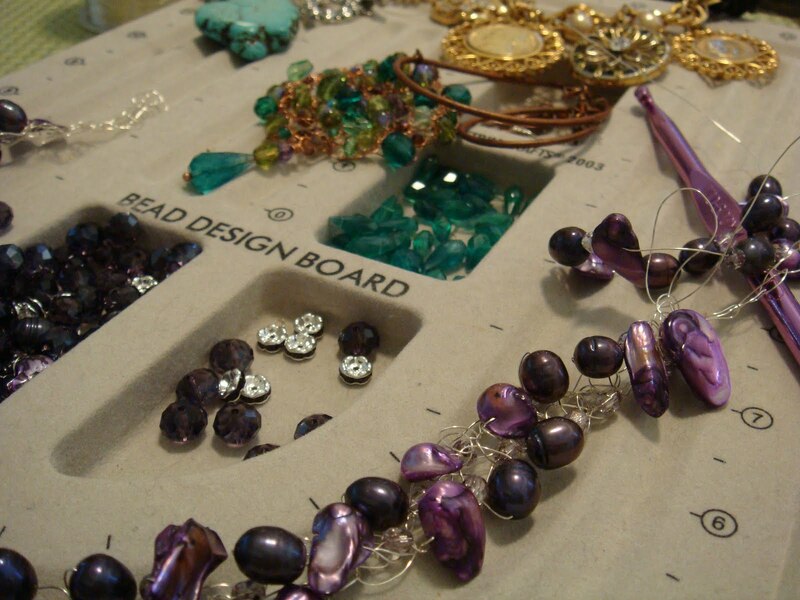 We are soo excited to get back to designing some beautiful pieces both for us and for you. So, you have already noticed that my blog got a makeover! I did like the other background design-it was fun and whimsical (thanks to www.itkupilli.blogspot.com) but after a year I was ready for a change to something more elegant to go with my jewelry designs. I have to thank my dear friend Karen Valentine (www.mydesertcottage.blogspot.com) for all of this. We completed it during our weekly craft nights at her house-she kept track of 10 open tabs and the job each one had, describing out loud what she was doing, while I sat next to her trying to soak up some of her creativity, insight, and computer agility. We will be adding a finishing touch as soon as we can find what we are looking for. The girl has got some whopping talent. I have known her for over 10 years and have been in her house thousands of times but always find something new she has done or redone and she will always share her techniques. It's like a mini-tutorial every time I come over! Thank you Karen for sharing your time, talent, ideas, and your big heart with me! Remember the post from Nov. 24 where I wrote about the Coral Sea necklace my friend, Marilyn, and I put together? I said I would get a picture of the finished piece. I decided not to permanently attach the two strands so that I could still wear them independently. Here is the Deep Coral Sea. The turquoise strand was handed down to me by my in-laws and they had it for many years. I love the way this picture came out-hot stuff! (The lava rocks are in my mother's back yard.) 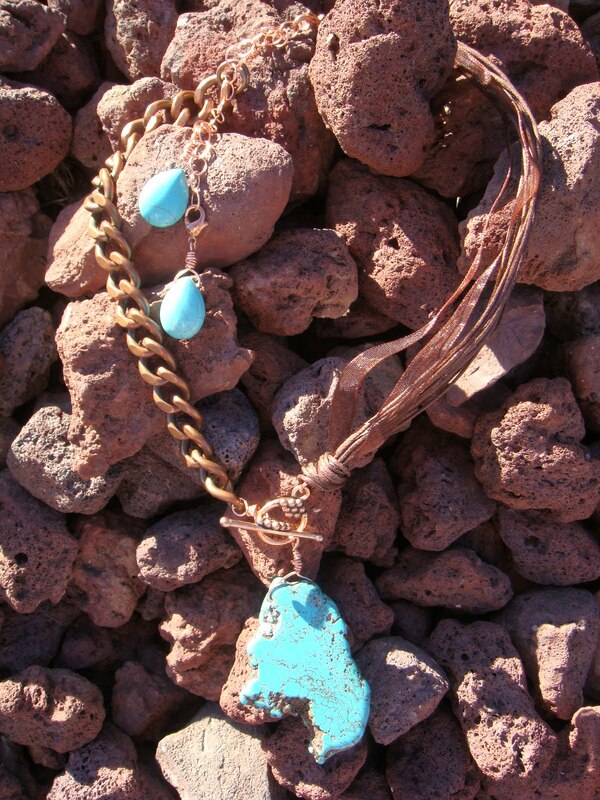 This will be my own personal necklace but I can always make something like this for you. 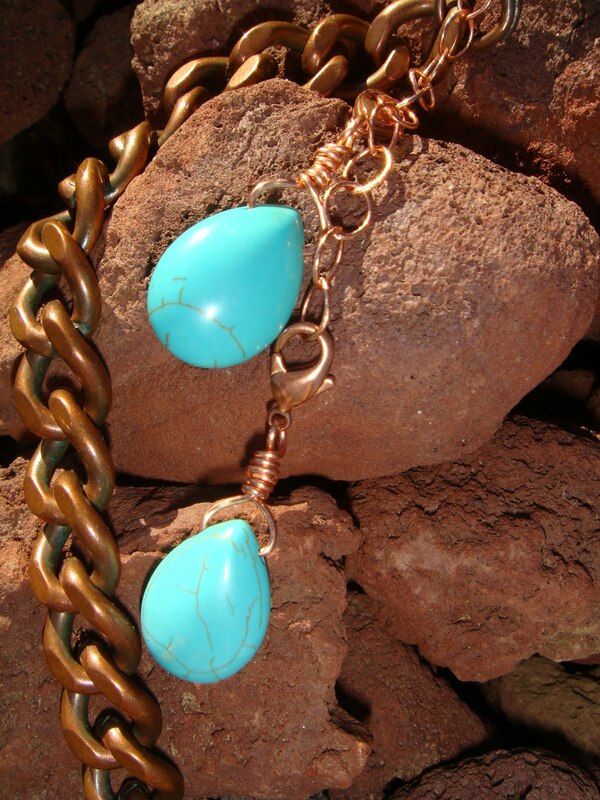 This will not be in my ArtFire shop so you will have to contact me for more info.